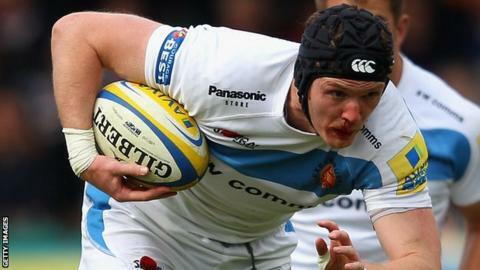 Exeter Chiefs forward James Hanks has been forced to retire after failing to recover from a neck injury. The 29-year-old and has been told by doctors that he must end his 10-year career. Hanks was part of the Exeter side that won the Championship title in 2010. "I've had lots of memories over the years, but I'd say that Championship final night at Bristol was probably the pick," he said. "It was the night things changed for all of us - not just us as players, but also for the club and for the supporters." "Personally, I don't think I could have asked for any more from my time with the Chiefs, but sadly this injury has brought my career to an end a little bit earlier than I probably envisaged. "Whilst the injury was fairly serious, I'm relieved that I'm now on the mend and I'm looking forward to what I do next away from rugby." Hanks made his Exeter debut in the old National One League, in a South West derby with Cornish Pirates in September 2005, and went on to make 192 appearances, scoring seven tries.